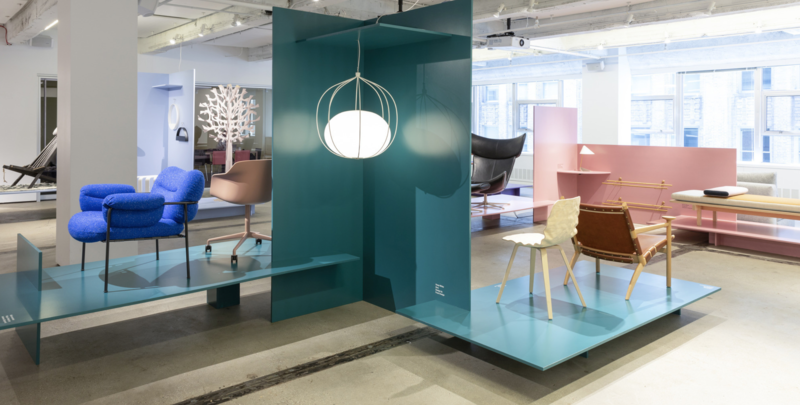 On May 21, 2018, the Norwegian Minister of Trade Torbjørn Røe Isaksen opened the exhibition # Together = Nordic Design, which was held at the renowned design and architectural firm Snøhetta’s location at Manhatten, as part of New York Design Week and the furniture fair ICFF. Nearly 300 guests participated in the opening of the exhibition, which was held by Lifestyle & Design Cluster in collaboration with Interior Cluster Sweden, Norwegian Rooms Cluster and Business Finland. The goal was to put a focus on good Nordic design and all the values we share and design from. “One year ago, Lifestyle & Design Cluster, as well as our Swedish and Norwegian partners, visited the United States and interviewed various brands to find out how we could support them in the US market. Their challenge was to get a vote and be seen by the press in particular. For the same reason, we launched the exhibition # Together = Nordic Design. It was a fantastic event and great to see that when you stand together and have a voice, we can make a much larger impression”, Says Lifestyle & Design Cluster’s Heidi Svane, who was the project manager for # Together = Nordic Design. “Nordic design has something to do with a Scandinavian way of looking at things. It has something to do with bringing the nature in, it has something to do with not being snobby, with finding not simple solutions but elegant solutions. And it has something to with democratically minded process both developing designs and ideas and also of making them and the products available to you people.” Says Torbjørn Røe Isaksen, minister of industry and trade in Norway. The exhibition contained design in the form of ceramics, furniture and lamps, so the nearly 300 guests got an insight into Scandinavian minimalism, quality and the values we all care about in the Nordic countries. Precisely the values have been one of the main points of the project, whose goal was to focus on Nordic design as a single unit. ”We worked with the word ‘Together’ which dicribed our way of putting all these nordic brands togehter, but it also says something about our society. It discribes the way we look at a sustainable society and design.”says Sofie Platou in her speach about the concept behind the event. The exhibition of selected Nordic design furnitures was built on a concept design by the famous architect house Snøhetta -based on the nordic values: playful, sustainability, togetherness, function, honest and contrasts. In the United States and many other countries, one sees Nordic design as the one category, and we clearly share some of the same DNA. Customers rarely differentiate between Danish, Swedish, Norwegian and Finnish designs. This project showed how a story starts with values and ends with design. In addition, the project gave the opportunity to gather all the Nordic forces in a collaboration to brand Nordic design, rather than each company having to brand itself. This gave a greater focus and more publicity. The graphic profile behind the project was designed by Snøhetta. The playful color palette was created by mixing colors from the four Nordic countries’ flags and creating a new and Nordic color scheme that could be used as visual effects. The Swedish colors blue and yellow turned into a green, which inspired from the Swedish forests, became darker. Denmark turned into a salmon colored pink from mixed white and red. Blue, white and red gave a light purple representing Norway, and to gather it all came the white color from the Finnish flag. Overall, the exhibition was a great success, which gave very positive feedback.